Travelterrific offers fabulous contests! Visit often to learn of the latest prizes. 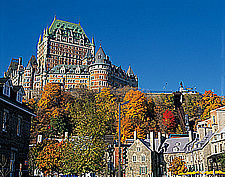 and stay at the Fairmont Chateau Frontenac Hotel. 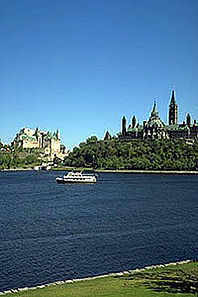 and stay at the Fairmont Chateau Laurier Hotel. Winners of Microsoft's Streets & Trips 2001 CD-ROM! This useful software helps you get where you need to be quickly and easily so you can enjoy the ride along the way. With up-to-date, detailed maps, it provides address-to-address routing, specific driving directions, trip planning and maps that can be easily customized. Winners of travelterrific's 2000 Canada Excursion! Jacquie Durand of Ajax, Ontario won the Canada Excursion for Two including three nights at Toronto's Royal York Hotel, round-trip VIA Rail business class transportation to Quebec City plus three nights at Quebec City's Chateau Frontenac Hotel. Gordon Sayers of Toronto, Ontario won the 2000 Canadian Encyclopedia Deluxe Edition 8 CD ROMS. It is the ultimate collection of Canadiana available on CD-ROM. Filled with an involving, entertaining series of works, pictures, maps and video clips, it is an excellent resource for anyone seeking to explore and experience Canada and the world in depth. Sue Jeffries of Lombardy, Ontario won the T550 Kodak Advantix Camera. This versatile Advantix Camera focuses on classic, group or panoramic shots. It comes complete with battery and instant-loading drop-in film cartridge. Visit travelterrific often to learn of the latest contests! All contest entries must include the following information: Name, Address, City, State or Province, Country, Postal Code, Phone Number, Age, e-mail address. The prizes and the entry deadline for the latest contest will be given in advance. Winners will be notified by e-mail only and must respond within seven days. If the winning entrant does not respond to the e-mail within seven days of transmission or does not comply with the contest rules, his / her prize will be forfeited and another winner will be selected. TRAVELTERRIFIC Inc. and Sponsors are not responsible for failure of the entrant to receive notification. In the case of multiple correct or optimum answers, one winner for each contest will be selected by random draw. Winners will be required to sign a declaration of compliance with the contest rules. Winners' names will be announced in travelterrific.com. Prizes, vouchers and tickets will be delivered to the address given at time of entry. Entrants release TRAVELTERRIFIC Inc. and Sponsors from all and any liability in connection with the contests and any prizes won. The prizes are not transferable or convertible to cash and must be accepted as awarded. *Delivery to certain locations around the world may involve a shipping charge. Why do you want to visit Canada? Write your answer in 75 words or less in the box below. Then click on submit. Tell why you want to visit Canada in 75 words or less in the box below. The winner must abide by the contest rules at the bottom of this page. How did you find out about Travelterrific.com?